Say it with words. 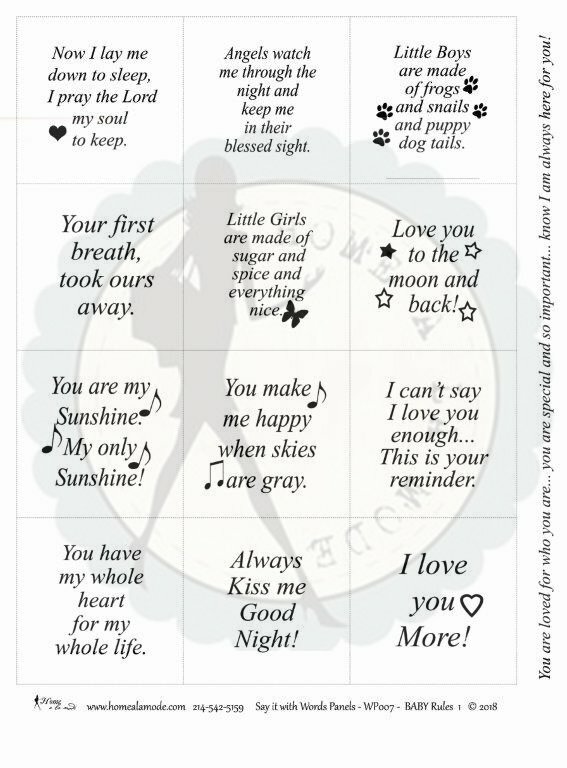 BABY RULES is a Home a la mode word panel that is all about the serious side of our feelings and the fun learned rules for babies... like: Now I lay me down to sleep, I pray the Lord my soul to keep. - Angels watch me through the night and keep me in their blessed sight. - Little Boys are made of frogs and snails and puppy dog tails. - Your first breath, took ours away. - Little Girls are made of sugar and spice and everything nice. - Love you to the moon and back! - You are my Sunshine. My only Sunshine! - You make me happy when skies are gray. - I can't say I love you enough... This is your reminder. - You have my whole heart for my whole life. - Always Kiss me Good Night! - I love you More! - You are loved for who you are... you are special and so important...Know I am always here for you! This panel is Copyright processed and No copies can be made. Company logo is not on printed panels. All printing done in Texas on Moda Bella 100% cotton. Create your quilt OR project to inspire someone special…”It’s a card in a quilt”.